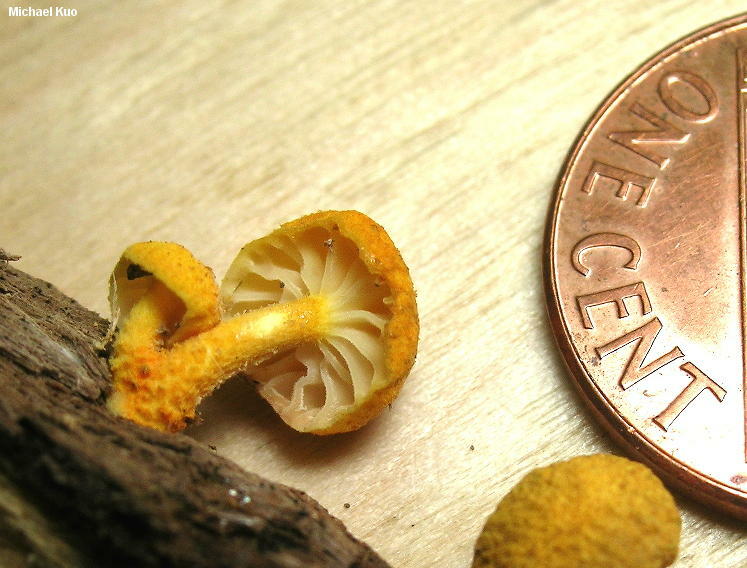 Tiny but gorgeous, this brightly colored fungus is well worth a close look. 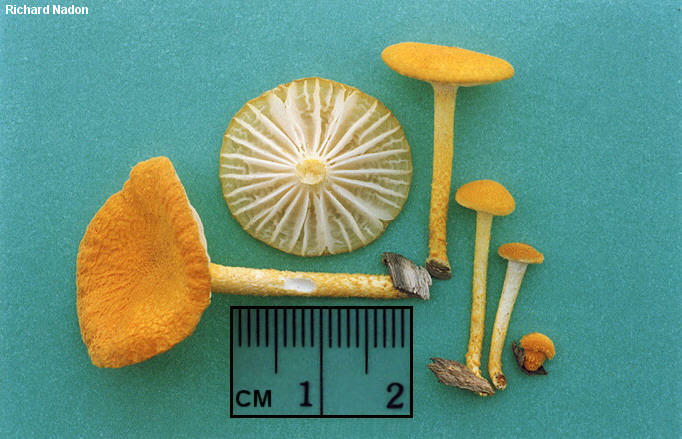 The bright yellow to orangish yellow cap and stem are covered with a granular, powdery coating; the gills are thick, white, and very distant; and the microscopic features--including lemon-shaped spores, prominent cheilocystidia, and a funky pileipellis--are interesting and distinctive. Cyptotrama asprata is found on the deadwood of all sorts of trees (conifers, hardwoods, whatever-woods), and ranges across much of North America--though it is apparently absent in the northwest and on the West Coast. Collybia lacunosa and Cyptotrama chrysopepla are synonyms. "Cyptotrama chrysopeplum," in several field guides, is a Latin grammar error. Ecology: Saprobic; growing scattered to gregariously on deadwood of hardwoods or conifers; summer, or over winter in warmer climates; widely distributed in eastern North America, and also reported from Texas and the Southwest. The illustrated and described collections are from Ohio and Québec. 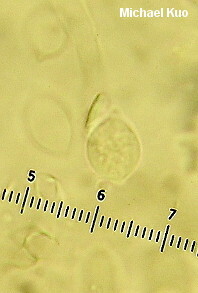 Cap: 9-20 mm; convex, becoming broadly convex or nearly flat; dry; granular dusted when young, remaining granular or becoming nearly bald with age; bright yellow to orangish yellow or dull yellow, darkening to brownish yellow with age; the margin sometimes becoming widely lined at maturity; the disc sometimes becoming wrinkled or nearly reticulate with age. 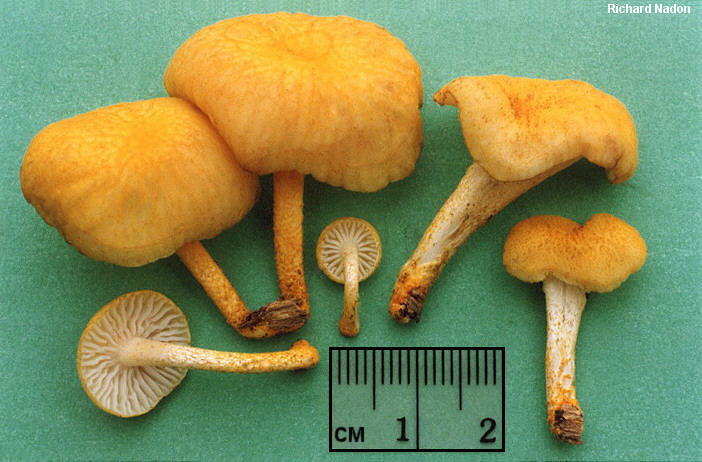 Gills: Broadly attached to the stem or beginning to run down it; distant; white; short-gills occasional. 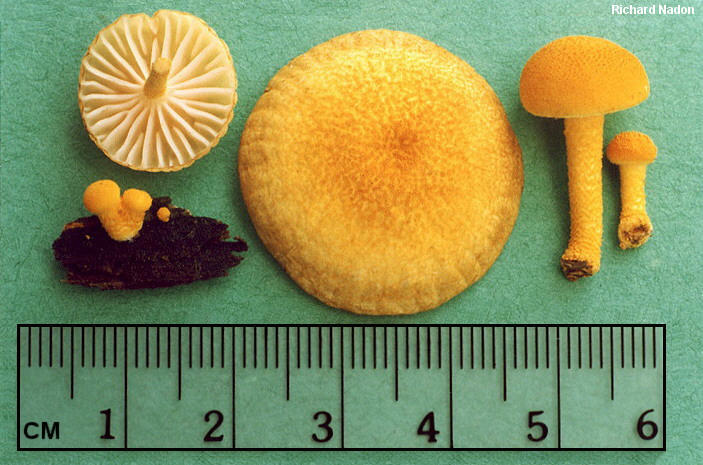 Stem: 10-40 mm long; 1-3 mm thick; more or less equal above, or tapering to base; often with a slight basal swelling; finely granular; dry; colored like the cap, or more pale. Flesh: Whitish to yellowish; not changing when sliced. Chemical Reactions: KOH pink on cap surface. Microscopic Features: Spores 7-11 x 6-7 µ; limoniform to sublacrymoid; smooth; hyaline in KOH; not cyanophilic; inamyloid. 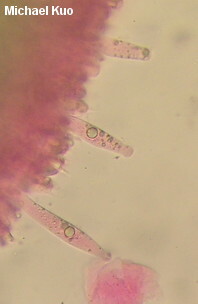 Cheilocystidia cylindric to subfusiform, with subcapitate or merely rounded apices; thin-walled; hyaline in KOH; 35-85 x 5-10 µ. Pleurocystidia scattered; similar to cheilocystidia, or more widely fusiform. Lamellar trama divergent. 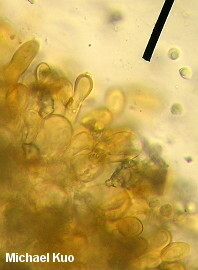 Pileipellis hymeniform (a turf of clavate to pyriform elements); elements thin- or thick-walled, golden in KOH, interspersed with scattered fusiform pileocystidia. REFERENCES: (Berkeley, 1847) Redhead & Ginns, 1980. (Kauffman, 1918; Redhead & Ginns, 1980; Phillips, 1991/2005; Lincoff, 1992; Barron, 1999; McNeil, 2006.) Herb. Kuo 10101001.